Jonathan Eike Art, Models, Props and More! I’m a firm believer that props and prop-replicas don’t have to be expensive. 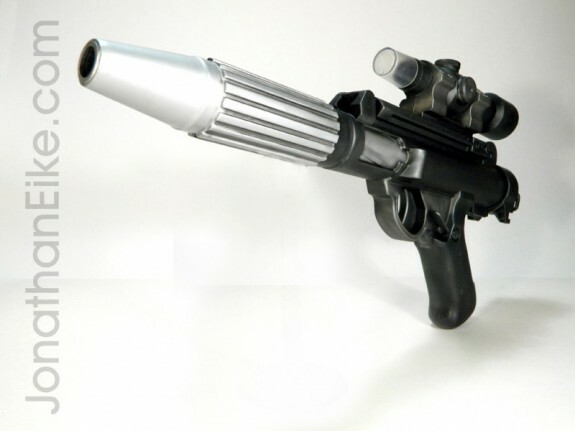 This rebel blaster from Star Wars is a good example. A simple re-paint of a toy. Only made some minor changes. Is it 100% screen accurate? No. Does it look the part? Yes. Would the prop department have used these if they had access to it? Maybe. Would it have looked as nice as this? Maybe, but not likely. Does it still shoot foam darts? You bet! Bottom line– I like it. And it’s cool if you do too. Jonathan Eike © 2019. All Rights Reserved.